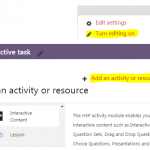 H5P is an exciting plug-in for Moodle that allows you to create interactive learning content directly on your Moodle page. The content is HTML5 format which means that it works across web browsers and devices, and which scales beautifully to device screen sizes. There are a range of content types available which you can explore on the H5P website. For example the course presentation allows you to create a slide show with embedded questions and other interactions. The interactive video allows you to overlay Youtube videos with questions, pop-up text and other interactions. 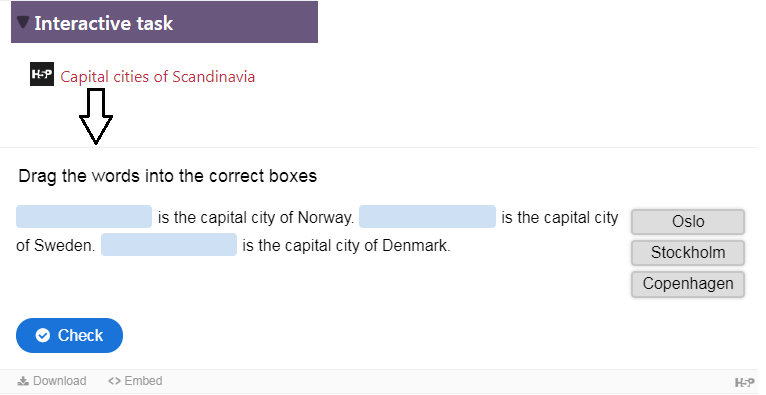 The following steps show how to create a drag the words question on your Moodle course. Turn editing on by clicking the cog icon (top right of the Moodle course page). 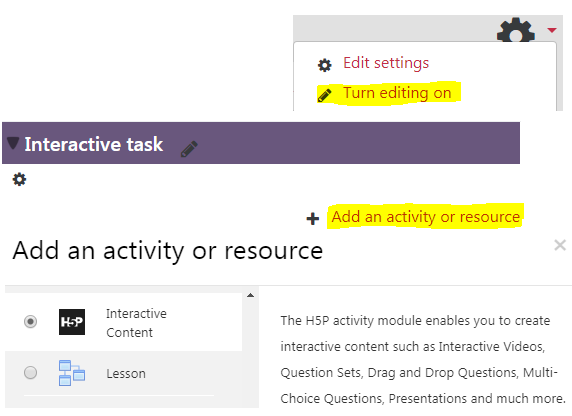 Select H5P Interactive Content option and give the activity a name. From the Editor menu select Drag the Words from the list of content types. Enter instructions in the Task description field. 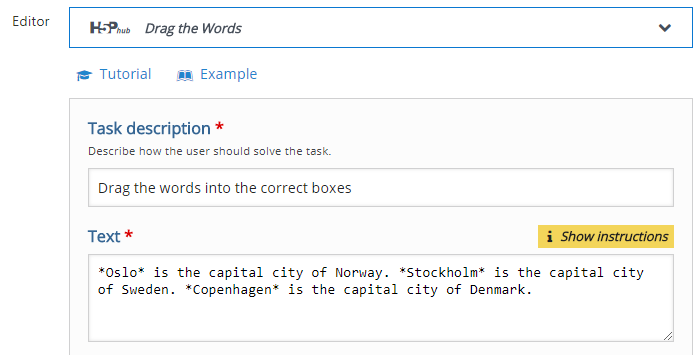 Type your sentences in the Text field and place asterisks on each side of the words you want to blank out. Click Save and display and the activity link is available. There are optional settings to give feedback for score ranges, and whether students can retry the activity or can reveal the solution. Note that any H5P content type that is scored will have a grade item created in Moodle Grades.Since these activities are purely formative you may wish to hide the Grade item or organise the Grades into Formative and Summative sub-categories.